Have you noticed new cracks developing in your home’s foundation? Although a number of different factors can contribute to these cracks, one of the most common causes of a cracked foundation is water damage. If your downspouts don’t discharge rainwater far enough from your home, it can pool around the foundation and cause damage that is expensive and difficult to repair. Learn more about how to spot signs of water damage on your foundation below! When water seeps through your foundation, it can cause discoloration on interior basement walls. If you notice water streaks and spots appearing on the walls of your basement, it could be because they’ve become saturated with moisture from outside. Does your basement have an unpleasant smell that just won’t go away? Does it seem to get more noticeable on rainy days? These musty odors are another common sign of moisture-related issues in basements. Installing a dehumidifier can help, but you should also make sure your downspouts are unclogged and oriented in a direction that carries rainwater safely away from the foundation. If rainwater is pooling around your foundation, those musty odors in your basement may be accompanied by mold growth, too. 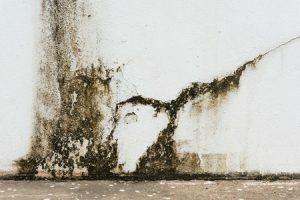 If you spot dark patches of mold growing in damp corners of your basement, you could have a budding moisture problem on your hands. If your gutters and downspouts are failing to protect your home from water damage, the team at Bell Seamless Gutters would be happy to lend hand. Our custom seamless gutter systems offer an attractive, low-maintenance and efficient way to divert rainwater away from your home. Give us a call or contact us online to learn more today!